1Dry Pasta & Rice It is always nice to have a 1 pound box, or two, of these popular pasta shapes: Penne, Spaghetti, Fettuccine, Farfalle (bow tie). To change it up, consider these pastas: Rigatoni, Orecchiette, Orzo, Capellini (Angel Hair). There are several types of rice that can be used for risotto and each provides its own bite and creamy texture. Here are some varieties to look for: Arborio, Carnaroli, Vialone Nano. Whether using Italian or American varieties, when making risotto always use rice that is “For Risotto” − long-grain white or brown rice is NOT the same and does not have the correct high starch content to use for risotto (as Nonna would say “Disastro!”). 2Extra Virgin Olive Oil Olive oils are like wines—the most expensive isn’t always the best. Try a variety of brands until you find the one that best fits your wallet and, more importantly, excites your taste buds. 3Canned Tuna & Anchovies I grew up in northern Illinois eating and enjoying canned tuna, either packed in vegetable oil or water. When I lived in Italy, the tuna was packed in olive oil. Mamma mia! What an incredible improvement! 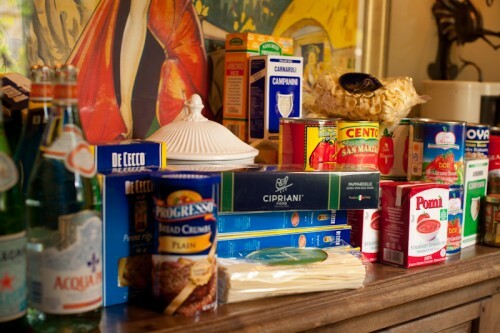 Nonna always had a couple of cans in her pantry to use at a moments notice for such dishes as Spaghetti con Tonno (in the book), among others. Anchovies: How these little fish got their bad rap in America I will never know. The salty and bold flavor can easily overpower a dish, BUT when used in moderation, they add a wonderfully indescribable background note to sauces. And, when paired with the subtle and milky flavor of fresh mozzarella, anchovies provide a salty nuance to cheese fillings and pizza toppings. Be brave, start small, and give them a try! 4Chicken Stock Sadly, most of us don’t find the time or see the simplicity in making and freezing our own chicken stock. Though homemade stock reigns supreme, having a couple of cartons or cans of low-sodium chicken, beef or vegetable stock on hand allows a soup to be a quick prep and it adds base flavor to beans, onions, and sauces. 5Dried Herbs/Spices I am not a big fan of Italian spice blends, which doesn’t mean you shouldn’t use them. Have your favorite? Then by all means use it. But here are dried spices/herbs that I like to use: Red Pepper Flakes, Dried Thyme, Fennel Seed, Dried Oregano, Kosher or Sea Salt, and Black Peppercorns (to use in a grinder). Oh, and keep some fresh nutmeg on hand to grate into cream sauces and cheese fillings. About Fresh Garlic: Contrary to popular belief, not every Italian dish uses garlic, but it is always nice to have a head or two of it standing by to cut a clove or two for a tomato sauce, or to rub on freshly grilled bread for bruschetta. I prefer the real thing over the “salt” or “powder” versions. 6Dried Bread Crumbs These can be seasoned or plain. I tend to keep the plain around so I have the option of flavoring them with my own choice of seasonings. These come in handy for topping a casserole or a baked pasta dish, for coating cutlets and meatballs, and even for coating a pan when preparing cakes or savory desserts. 7Canned Tomatoes I keep two prepared kinds on hand: (1) Whole, peeled, canned (28-ounce) Italian tomatoes, preferably San Marzano and (2) Strained tomatoes, usually cartoned from Italy (26-ounce). I find Pomi the brand most readily available. 8Beans I prefer to use canned beans over dried beans, but, if you have the time, dried beans are fine to have on hand, too. Cannellini beans (similar to white kidney beans) and Borlotti beans (also known as Roman or Cranberry beans) seem to be the two varieties I use most often – and they seem to be the most popular in Italy, too. 9Wine I use wine as much for cooking as for drinking—in fact, probably more for cooking! There is one hard and fast rule: NEVER cook with a wine that you would not drink from a glass. Bottled or boxed “cooking” wines are not the same as drinking wine. Always stick to the drinking variety when cooking. I prefer to drink red wine, so I tend to have more red wine in my pantry, but keeping a bottle of white chilled in the fridge is not a bad idea either. Again, price isn’t as important as using one that tastes best to you. 10Vegetables Yes, these are more perishable than the other items on this list, but russet potatoes, yellow onions, and frozen green peas and spinach are essential items to have at hand. Frozen peas are the next best thing to fresh, seasonal peas and, when on hand, they are a simple way to add springtime flavor to pasta dishes and soups. A box of frozen spinach in the freezer assures that making a stuffed pasta filling, frittata, pasticcio, or handmade spinach pasta can happen on a whim.